The Western Negev’s Ruchama Forest has become one of my “go to” spots for magical wildflower photographs over the past four years. 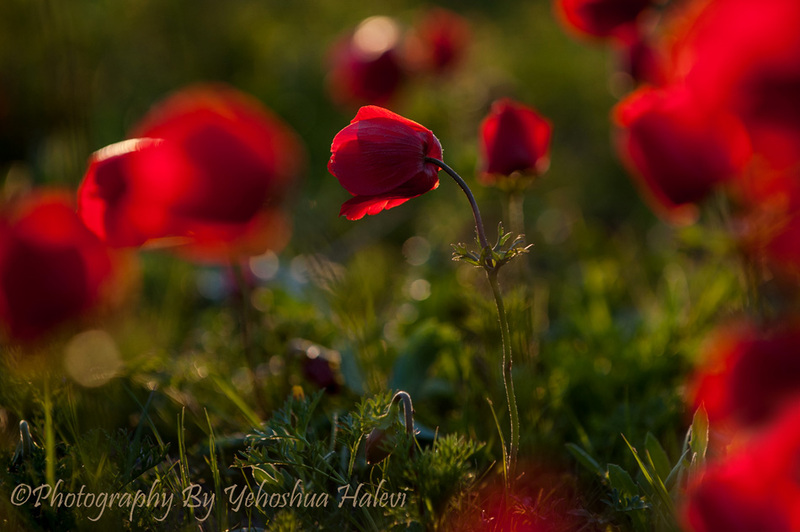 The prolific, red “kalanit” (anemone) is predictably spectacular and the star of the Jewish National Fund’s aptly named Scarlet Spring Festival. Two important considerations if you plan to visit this region during the next month: Avoid Fridays as well as arriving too early in the morning as the sun-following flowers remain closed until roused by their solar alarm clock. Afternoons are better and the rolling hills and open forest provide plenty of compositional variety. And dress casually as there is ample opportunity for my favorite camera angle, seen in this week’s photo: lying prone on the ground, eye level to the colorful beauties. Join our magnificent sunrise-to-sunset workshop in the Mahkesh HaGadol – Click here for details. This image exemplifies the development of my photographic vision, from a beginner who tried to move everything inessential out of the path of my lens, to a more artistic approach in which stray objects and soft focus became key components of the composition. The effect is further accentuated through the use of a telephoto lens zoomed out to 140mm and a wide aperture to squash the depth of field. The first steps are identifying a suitable subject and the best angle to the light. After that, everything else falls into place. This is one time when seeing red will put a bounce in your step and a bunch of delightful images in your photo library.